NOTE: This guide has been developed for use as an optional aid during inspections. The information contained in this Appendix mirrors the information required in Appendix D of the standard, a mandatory appendix. 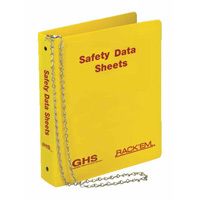 Get your SDS binders, centers and more from Safety Emporium. Product identifier that is on the label. Recommended use and restrictions of use. Contact information for the responsible party (name, address, phone number). end. There is no requirement for the emergency number to be staffed 24 hours per day if the SDS specifies the restrictions on the contact hours. The emergency contact number can be for a company contracted to provide information in the case of an emergency. The knowledgeable person must be able to answer questions and be understandable (e.g., speak English). Note: If the company name, address and phone number are located at the top of the page instead of in Section 1, this is a de minimis violation and a citation shall not be issued. Hazard Classification(s) - including hazards not otherwise classified. The Hazard Classification includes the Class and the Category, e.g., Flammable Liquid, Category 1. Signal word(s), hazard statement(s), symbols (pictograms without the border) or a description of the symbol, precautionary statement(s). Unknown acute toxicity percentage if the ingredient with unknown acute toxicity is present at a concentration ≥ 1% and the mixture is not classified based on testing of the mixture as a whole. Chemical name, common name and synonyms. Chemical Abstract Service (CAS) Registry number and other unique identifiers. If the chemical is a substance, impurities, and stabilizing additives which are themselves classified and which contribute to the classification of the substance. present a health risk below the cut-off limits. Concentration ranges may only be used where a trade secret is claimed in accordance with paragraph (i), for batch to batch variability, and for a group of substantially similar mixtures. If a trade secret is being claimed, a statement that that the exact concentration or ingredient identity is being withheld for that reason. Necessary first aid measures by route of exposure. The most important symptoms and when they occur (acute/delayed). Whether medical attention is needed immediately and any special treatment, if necessary. Any specific hazards caused by combustion of the material. The required PPE for fire-fighting. Precautions, PPE, and emergency procedures required for spill cleanup. Methods/materials for containment and cleanup. Safe storage conditions, including incompatibilities. OSHA permissible exposure limit (PEL), American Conference of Governmental Industrial Hygienists (ACGIH) Threshold Limit Value (TLV)®, other exposure limit(s) recommended by the SDS preparer (including ceiling and other short-term limits). 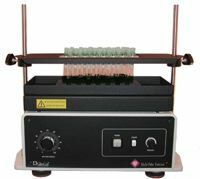 Procedures are a breeze with laboratory vortexers from Safety Emporium. Appearance (physical state, color, etc.). Initial boiling point and boiling range. Upper/lower flammability or explosive limits. 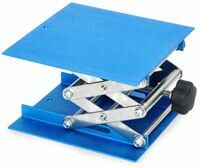 Conditions to avoid (e.g., static discharge, shock, vibration). Symptoms related to the physical, chemical and toxicological characteristics. Numerical estimates of toxicity (such as acute toxicity estimates). Immediate, delayed, and chronic effects from short- and long-term exposure. 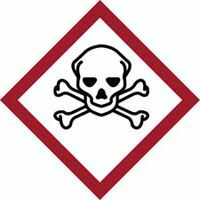 Whether a chemical is listed by NTP, IARC or OSHA as a carcinogen. Are sections 12-15 present? The lack of information in these sections is not citable; however, the headings are required and would be a de minimis violation, 1910.1200(g)(2). The full tittle of Section 16 is "Other information, including date of preparation or last revision." It is permissible to title Section 16 "Other information." Including date of preparation or last revision - This does not mean date of printing. The use of the statement "valid on the date of printing only" is inconsistent with the requirements of the HCS as the SDS is intended to be a reference document that reflects the most accurate and current information about a specific hazardous chemical that is available at the time the SDS is developed. If new information has become available, have the SDSs been updated within three months? If there is no relevant information for a section or subsection (e.g., flash point), the SDS must state that no applicable information is available (NA or none). Entry last updated: Tuesday, July 26, 2016. This hypermarked and content-enhanced page is copyright 2001-2019 by ILPI, all rights reserved. Unauthorized duplication or posting on other web sites is expressly prohibited. For questions, comments and concerns, please contact us at our MSDS email address. The official, public domain, OSHA version of this document is available at https://www.osha.gov/OshDoc/Directive_pdf/CPL_02-02-079.pdf.